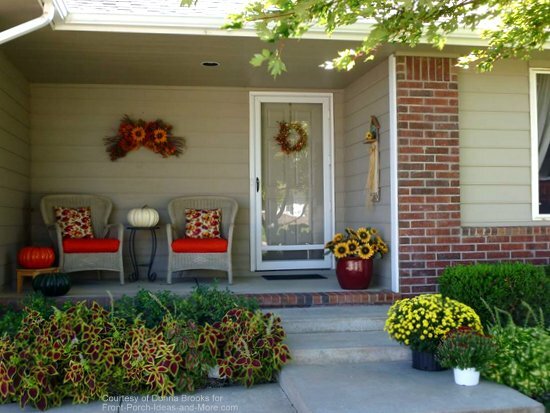 Our fall decorating ideas and autumn crafts for the front porch will help you create an envious front porch display. 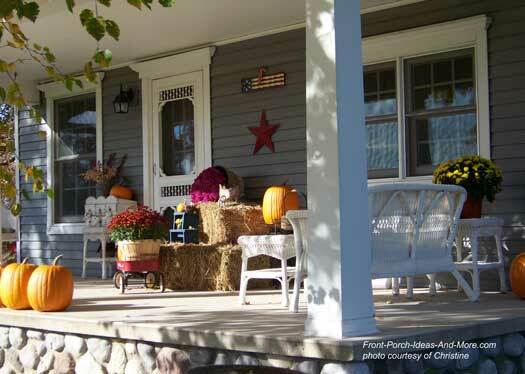 Use our favorite front porch pictures to find ideas for your own porch and home this year. Not only will you find plenty on this page but be sure to visit our entire autumn decorating section. 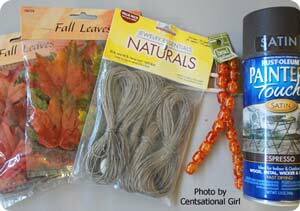 These fall craft projects, whether making the leaf wind catcher or fall mesh wreath, are perfect for kids of all ages. When finished with those projects be sure to use our links at the bottom of the page to find even more porch decorating ideas and projects. 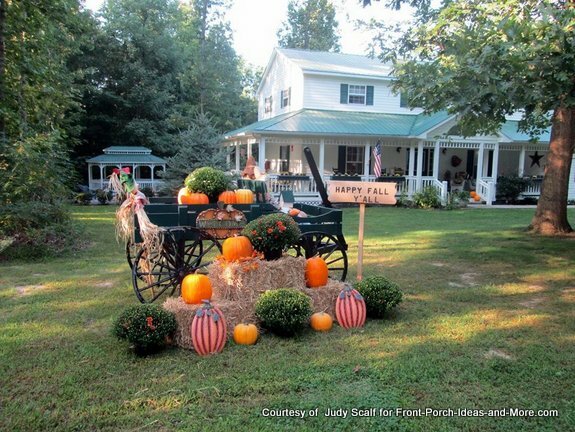 Judy shared this picture with us of her yard this autumn. Isn't the wagon awesome? It's loaded with mums and pumpkins and makes for a perfect backdrop for the hay bales and all. Wagon envy here! Her talented husband built not only the wagon but also the sweet sign. Judy had a little wagon about three feet long sitting on their porch and her husband Dave took it down to his workshop and made a big wagon from that. They visited the Amish country and got a old set of wheels from them. She says that he is a keeper. And we totally agree! 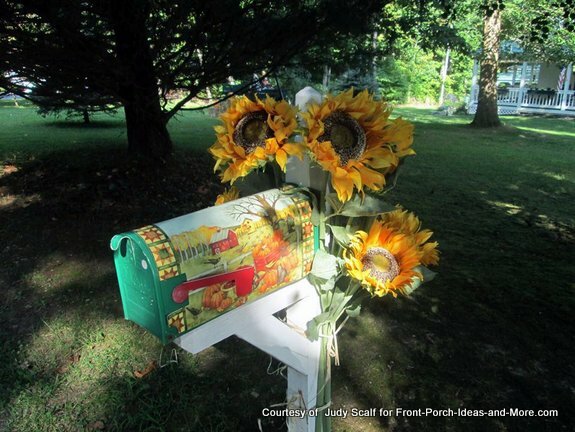 Here is Judy's mailbox decorated for autumn with sunflowers and a cute mailbox cover. Just the perfect touch to say "welcome"! 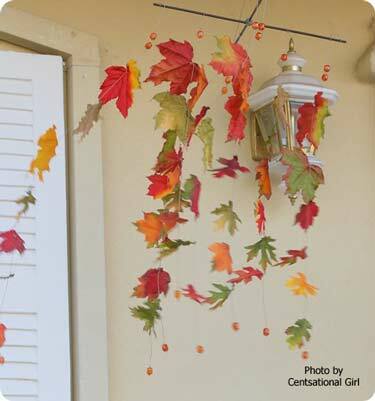 A fall decorating idea that is easy to accomplish yet so nice to behold. 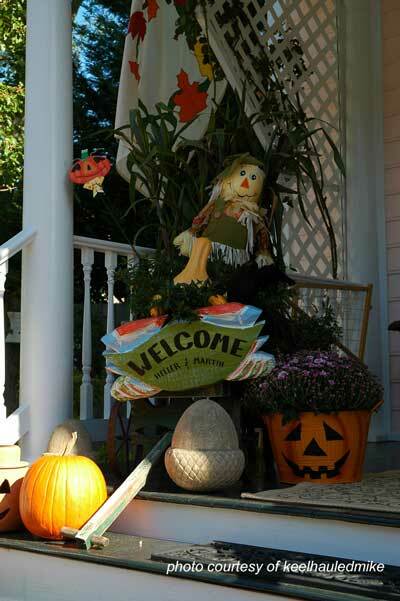 Create groupings, using items like straw, wagons, pumpkins, and corn stalks to decorate the front door to your house to make a lovely autumn display. Note how the straw bales add both height and dimension to the display. This delightful display also adds elements of height while incorporating the porch steps. Painting a bucket to hold colorful mums is easy to do; make it whimsical or just use autumn colors. 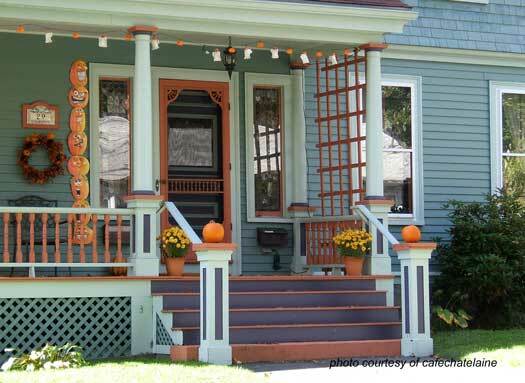 This cheerful autumn porch is quite whimsical. We love how the blues and oranges complement each other. 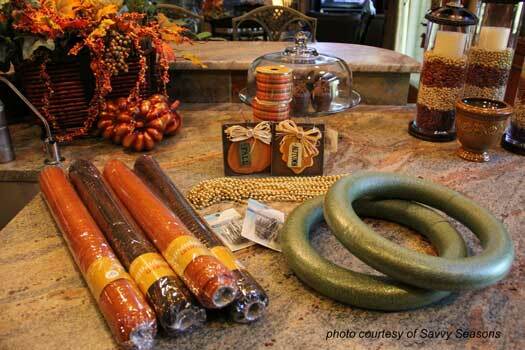 We love the fall decorating ideas we found on Kate's blog Centsational Girl. 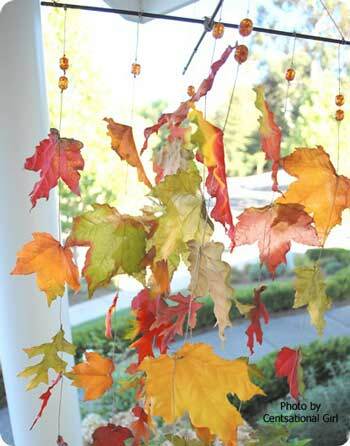 We think you'll enjoy Kate's autumn craft - a charming wind catcher made of fabric autumn leaves. 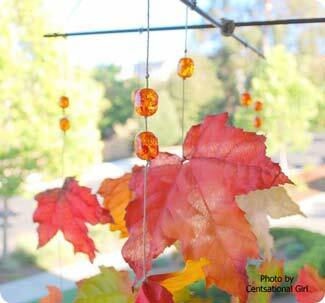 Kate made this autumn craft, a wind catcher, with her five year old daughter, to hang on their front porch. Made with fabric leaves and sparkly amber beads, it's sure to be a conversation spot on your porch. I think this would be very fun to make with one of my grandchildren. How about you? 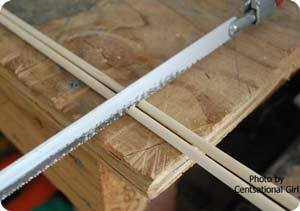 With a saw, cut your dowel in half. Carefully, of course! Paint the dowel brown, if you like. We think that Kate's turned out nice. 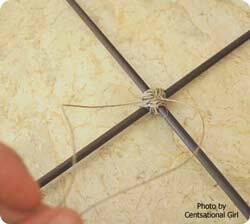 Now, make a knot at the bottom of your string and then add a bead (as an anchor). Then snip a little hole in a leaf (near the top). Thread the string through the hole. 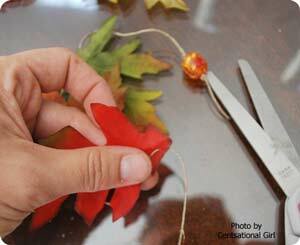 Continue adding leaves and knot the string each time (after every leaf). Add beads at the top, too, as anchors and decoration. 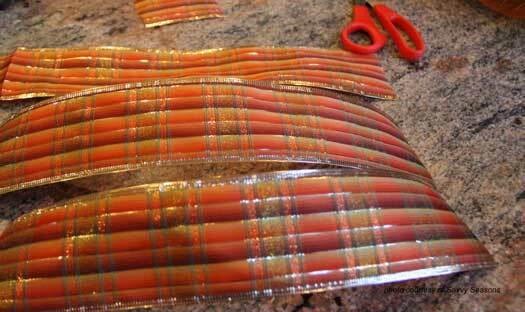 Make several strands to hang from your wind catcher like shown in Kate's photo below. Looking at the photo really helps. Criss cross your dowels and tie them. 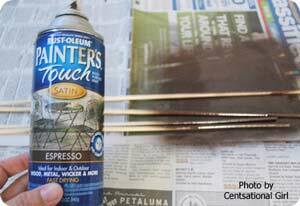 Make sure the paint is dry, of course! Kate glued the dowels together and then secured them with more twine. Now for the moment when you can hang your creation where the leaves will blow in the wind. Don't you just love the sparkly beads in the sunlight? 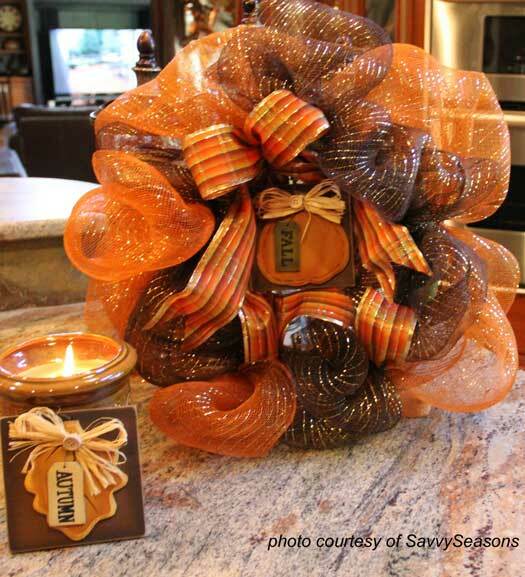 We are so glad to have found Kate's crafty blog Centsational Girl and learn from her fall decorating ideas. 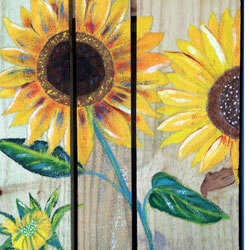 Stop by her blog to see oodles of fabulous ideas. And don't forget about her pumpkin decorating tips & ideas that she shared with us, too. 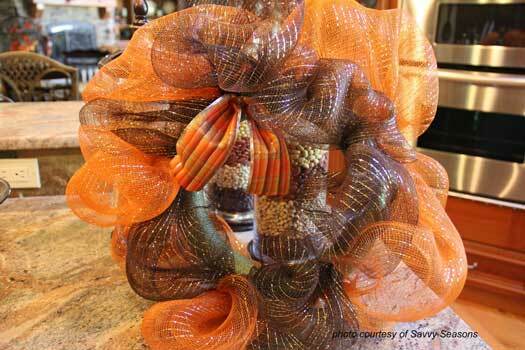 Mary and I are excited to share Liz's autumn ribbon wreath instructions with you. 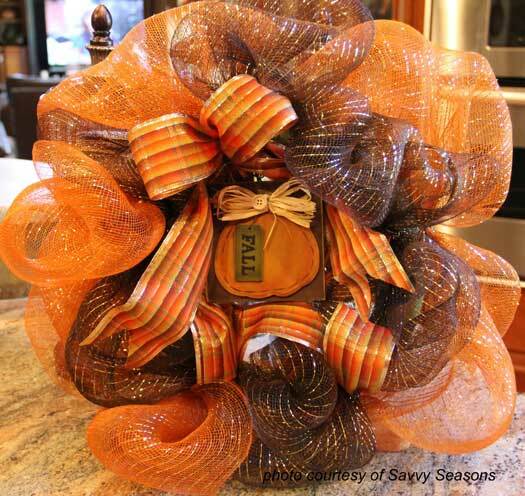 Liz, author of the blog Savvy Seasons, has graciously shared her tips and techniques for making this wonderful fall wreath to be used indoors or out. We think it would be perfect for the front door, of course! Liz believes the greening pins saved her a lot of time making the wreath. 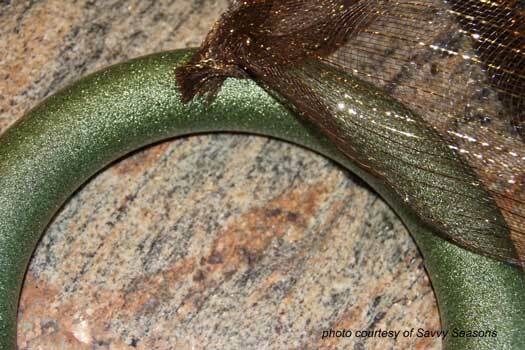 She simply gathers the mesh and pushes the greening pin through it into the foam. TIP: Liz discovered that for a more finished look, wrap the smaller ribbon around the foam wreath first, completely covering it. Continue with step 2, spacing out and pinning the gathered mesh approximately an inch apart. After you have completed pinning the first color, begin using your other color and cover the outer part of your foam. Liz cut long strips of ribbon, folded the strips on half, and pinned those into the foam forms. She pinned the ribbons around the foam ensuring all bare spots were filled. To finish the mesh wreaths, Liz added a bow and the pumpkin signs by pinning them also. 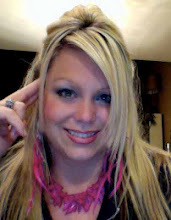 Our special thanks to Liz of Savvy Seasons for sharing her mesh ribbon project.